Cliff Jacobson is one of the wise men of the outdoors. He is one of North America’s best respected and most published outdoors writers. He is the author of over a dozen top-selling books on canoeing, expeditioning, camping and outdoors skills. His excellent book Expedition Canoeing is a vital addition to any wilderness paddler’s library and a favourite resource of mine. Cliff’s extensive wilderness experience informs his writing with realism, pragmatism and practicality. He’s a true outdoorsman and he values skills over things. For all these reasons Cliff is one of my outdoor heroes, someone I look up to. So, it was a great honour for me to be able to contribute – albeit in a relatively small way – to Cliff’s latest book. Towards the end of 2011 Cliff sent out a request for various images to illustrate the upcoming 25th anniversary edition of his classic Camping’s Top Secrets: A Lexicon of Expert Camping Tips. I have an extensive archive of photographs from my trips and expeditions; I thought that some of them would be suitable for Cliff’s requirements. I got in touch with Cliff and pointed him in the direction of some of my photos on Flickr. Cliff was indeed interested in using one that I took on a winter camping trip in the northern forest. 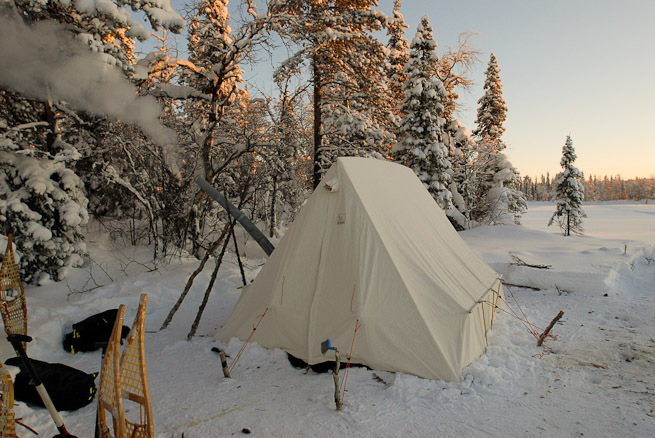 My winter camping photo used in Cliff’s book. Roll forward over a year and Cliff’s new book is ready. I already have my copy. 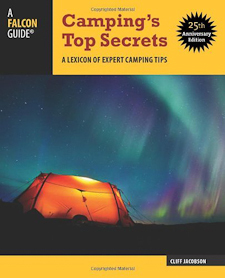 It is an A-Z of great camping advice covering more than 200 pages. As a thank you, Cliff sent me a copy of the book and I was delighted to find it in my mail box yesterday. 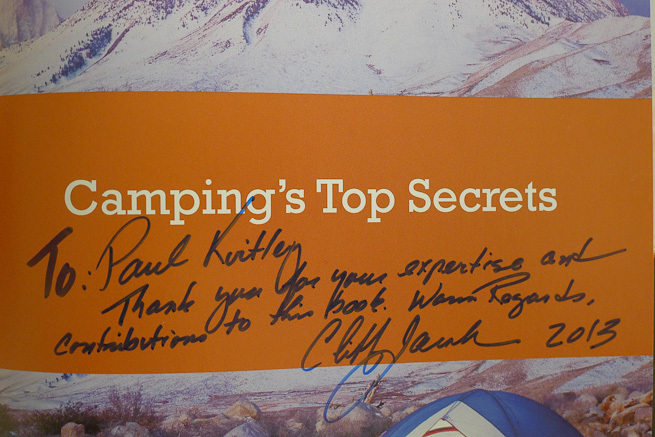 Inside, Cliff had inscribed “To Paul Kirtley. Thank you for your expertise and contribution to this book. Warm Regards, Cliff Jacobson 2013”. Cliff is not only an expert in his field but a true gentleman. Receiving the book and reading his comment certainly made my day. Cliff is a man who talks sense about the realities of wilderness travel. In this interview, Cliff speaks frankly about wilderness camping skills, journeys in remote country, the risks, bugs, bears and the one indulgence he likes to take with him. Camping’s Top Secrets is published by Falcon Guides. UK and European readers of this blog, can purchase a copy from Amazon here. For readers in the rest of the world, including North America, the publisher has a list of places you can buy the book here. Great article again Paul, keep them coming. In my ignorance I had never heard of this man- but watching the video I have already learnt a few things. He appears to be a real outdoorsman with real values- out of the ‘old school’. I can see why it made your day and of course was another affirmation of your skills. Thank you for bringing another guy with a wealth of knowledge to my/our attention. Another great article, this one is really dead on! I am lucky enough to have been able to spend some time with Cliff Jacobson, and consider him one of my great outdoors mentors. When I was a kid, my dad had a copy of one of Cliff’s early books, Canoe Camping, and it taught us a lot about backcountry travel. Some 20+ years later after seeing him present many times, and reading several more of his books, I was able to meet the man personally. For each of the last 3 years Cliff has donated a weekend of his time to conduct an “Expedition Canoeing School” for our local (Minneapolis/St. Paul, USA) Boy Scout council. 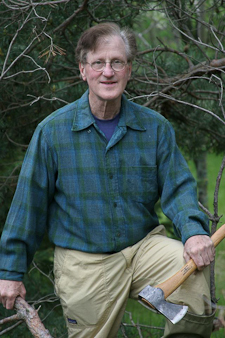 I’ve organized the event, but it is all Cliff giving the show, using his flagship book, “Expedition Canoeing”, as a template to share his incredible knowledge and experiences, while raising thousands of dollars for the council’s Eagle Scout Scholarship fund. Cliff is a passionate and practical outdoorsman, and a great guy! He certainly does value traditional skills, but is also an expert on modern equipment and techniques. He needs to be, for decades he’s been guiding people deep in the Canadian bush on wild rivers, where help is only available via a sat phone call to a bush pilot, if then. Even if you aren’t a canoeist, I highly recommend his books. There is a wealth of information about backcountry trip planning, travel and skills. Congratulations on having your photo selected! Good to hear from you and thanks for your message. I’ve never met Cliff in person, although I have communicated with him by email. I hope our paths cross at some stage. It’s great to hear that your experiences with Cliff coincide with how he comes across in his books and on video – both genuine and passionate. Are you aiming that question at me or Mr Jacobson?